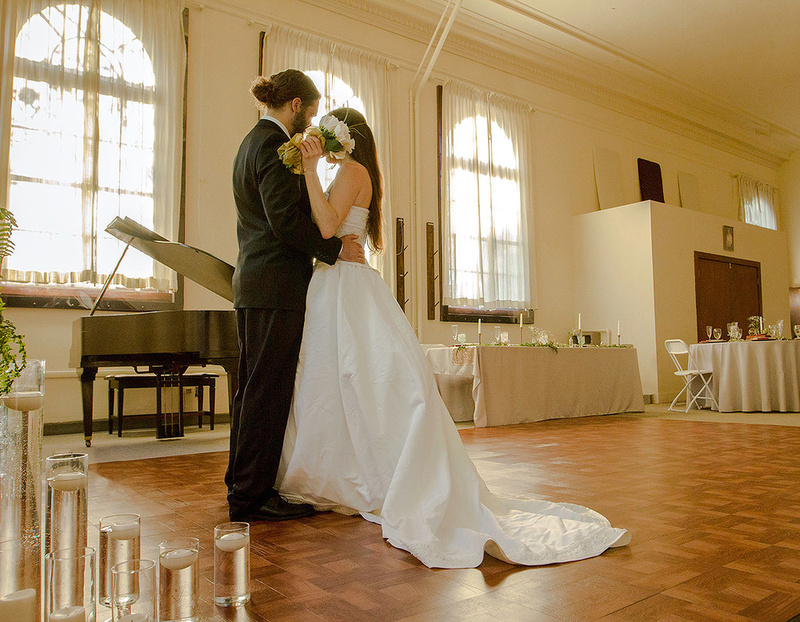 Hallowed Halls Studios in Portland, Oregon, in its guise as wedding venue. Much has been written about music’s displacement in the cultural hierachy by everything from VR and AR to video games, and to some extent the fortunes of the recording studio have suffered with it. However, the traditional recording studio retains a certain kind of allure, even for those who have some of the tools of music production in their spare bedrooms or garages. There remains a sense of enchantment when pushing open that thick door of some massive Studio A somewhere and feeling that first rush of air conditioning as the ambience changes. These two iconic studios are by no means alone. Studio facilities of all sorts have hit upon the idea of making themselves available for purposes other than making records. Playground Studios in Indianapolis suggests uses including fashion, comedy, burleque and drag shows, as well as bar- and bat-mitzvahs and graduation celebrations. Hallowed Halls Recording Studios in Portland, Oregon will happily see you recorded or wed in a neo-Federalist manor that’s listed in the National Register of Historic Places. And it’s not just an American idea — even the truly hallowed halls of Abbey Road Studios, including the Beatles’ Studio 2, are available for hire for any sort of event you might imagine. As the Ruttles sang, all you need is cash. Bringing events into studios when they’re not making music is a way to monetise what would otherwise usually be down time, and also to leverage the studio’s brand. And, say studio managers, it takes nothing away from either a studio’s legacy or its current status. “In fact, I think it reinforces the status of the studio, and the importance of large recording studios, period.” That’s Pat McMakin, who has been managing Ocean Way Nashville for the last decade, and who says the number of non-traditional events taking place at the studio has mushroomed from three or four per year to that many in a month or even in a week now. Part of that is collateral to Nashville’s growth as a tourist destination (it’s become the second-leading destination for bachelorette parties now after Las Vegas), but the studio’s own renown has a lot to do with it: besides turning out hits for artists like Faith Hill, George Jones, Avril Lavigne and Paul Simon, it also has its architectural legacy as a one-time church, and now as a destination for recording of orchestral scores for leading video games including Call Of Duty: Black Ops and Madden NFL 2016. You couldn’t ask for a venue with a better back story. “Wedding and event planners are now seeking us out,” says McMakin, whose own daughter had her wedding event there. What Bibler also finds attractive is that even when studios charge their full card rate for a daily lockout, it’s still less than even the most basic conventional locations such as hotel ballrooms and picturesque mansions, which she says can start at close to $3500 a day. It suggests that the studio-as-event-site business model has considerable headroom left in it. That a studio might be more valuable as a place to make whoopee rather than music may simply reflect the times we’re in. The professional sports industry offers some context: the NBA’s LeBron James earned $17.8 million from his contract with the Miami Heat last year, while his endorsements with Nike, Coca Cola, McDonald’s, Sprint, State Farm and Baskin Robbins, among other sponsors, earned him $42 million in the same time period. As music production continues to undergo a roiling technological and cultural evolution, conventional studios continue to seek ancillary revenue sources; everything from becoming tech incubators to being backdrops for film and TV shoots and fashion shows. It turns out that letting people put on a party in them might turn out to be one of the more lucrative of those ideas. And a bit of fun too.